A Power of Attorney is a legal document that you make to allow someone (the ‘Attorney’) to make decisions on your behalf. 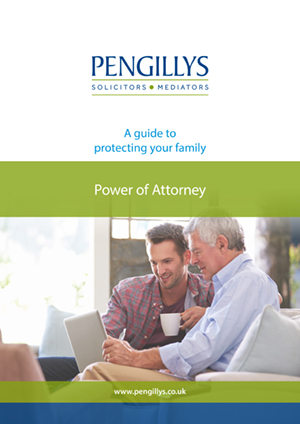 There are different sorts of Power of Attorney for different circumstances including a General Power of Attorney and a Lasting Power of Attorney (LPA). A Power of Attorney must be made when you are fully mentally capable. A General Power of Attorney will cease if you lose capacity. An LPA is more complicated and time consuming but will continue if you lose capacity. An LPA can only be used when it is registered with the Office of Public Guardian and a registration fee per document paid. A General Power of Attorney does not require registration. A Financial Decisions LPA, allows your Attorney to make financial decisions on your behalf about your property and affairs. It does not allow your Attorney to make decisions about your personal welfare. A Health and Care Decisions LPA allows your Attorney to make decisions on your behalf about your personal welfare, including whether to give or refuse consent to medical treatment on your behalf and deciding where you live if you have lost capacity. It does not allow your Attorney to make decisions about your property and affairs. The Court of Protection is a specialist court for those who lack the capacity to deal with their own affairs, and who do not have a Power of Attorney in place appointing Attorneys to act on their behalf. If you or a loved one loses or lacks the capacity to deal with personal affairs and there is no Power of Attorney, an application can be made to the Court of Protection to appoint a Deputy. The Deputy may then act on the person’s behalf. Partners of Pengillys are often appointed as a Deputy. The framework for dealing with those wishing to apply to the Court of Protection is provided by the Mental Capacity Act 2005, which sets out five Statutory Principles that the court must follow in order to protect those involved. Applying to the court to appoint a Deputy can be complex and involves a series of forms and requests for information. Once appointed, a Deputy is required to carry out various duties including making a Deputy Report to the Court on each anniversary of the Order. We have considerable expertise in dealing with Court of Protection applications and pride ourselves in guiding potential Deputies through a process that can be challenging both technically and emotionally. Please contact us to find out more.